Please tell me where has the time gone. I am sitting here not even believing that the babies are now 8 mos old TODAY. Who would have thought, that time would have flown by so fast? The last 8 mos have been the most exciting and sometimes trying times I think I have ever experienced, as side from Haidens years of headaches and brain surgeries. But as a great friend shared the scripture with me (that I now live by) " I can do all things with Christ who strengthens me" Boy, I am ever so glad she said that to me one day. I rely on it lots. Ella-OR Priss Ella or Lizard as we call her around here now. She is now smiling with her tongue pointed out like a lizard. She has now learned to blow raspberries when she eats, roll over both ways, gives kisses ( mouth wide open of course), and rocking back and forth on her knees. She is up to 15 lbs. Cole- or Colie Olio is doing great as well. His smile will melt your heart for sure. He is jumping like a mad man in the jumparoo, he has finally quite scooting backwards and now gets on his knees and kind of hops forward. It is too funny. He also has this new thing where if you don't put his bottle in his mouth fast enough, he starts thrusting his pelvis up and down. If you remember he was the one in the NICU that would smile with his Elvis lip. Cooper - or Coopie, Coops, toupie or cooper the trooper-is the official STEAM ROLLER, he rolls both ways as fast as lighting, he amazes us, He has just this week started getting up on his hands and knees and rocking. I think he figures why learn to crawl when you can roll where you need to go. I must say he has gotten better at eating, he doesn't think he has to stand on his head anymore to eat. Not sure what that was ever about. He is still the biggest, weighing in at 17 lbs. And to think, he almost did make it. He never ceases to amaze us. Casen- or Tasen, mama's baby - Yes he is for sure a Mommy's boy. He figures he is the baby, and he wants everyone else to know that too. He is trying to push himself up from his tummy to a sitting position. He is about half way there. He is also on hands and knees, except he gets on hands and toes and then hops. Bless his heart, he keeps bumping his forehead every time he lands. He is the official RASPBERRY blower, but of course not until his mouth is full of food. I think I ought to go into business for myself, making food splattered clothing. I am sure you moms can appreciate that. Hey, at least we would already be in dress code for feeding babies. Ok, Ok, I am just kidding. Before I forget to mention, they have offically started fighting over toys. I can only imagine what it will be like when they are totally mobile. We all celebrated Thanksgiving at Jeremy's parents house with his family. Nana, Aunt Debbie, Uncle Mark, Auntie Ashley & Kelly, and Auntie Chelsea also joined us. It was great! We had good food, good times, and great memories. The babies hung out in there exersaucers and then went down for a nap. We did manage to get a family photo that day. We had our first professional family photo shoot on Sunday, I will hopefully get to see some proofs and post them soon. Big huge "thank yous" go out to Popo, Nonnie, Auntie Heather, Gavin and Nana for helping us make that day as successful as possible. 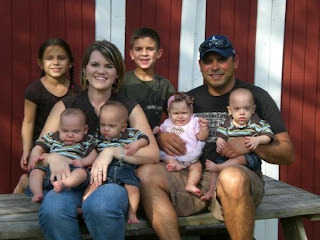 They say it takes a village to raise a child, so I am thinking it takes an ARMY to raise multiples. Or at least get them to and trough a photo shoot! Here are some pics for you to enjoy of our first Thanksgiving since the quads have been born. Great family pic! I love the tippy toe crawl one. lol. My 8-month old is beginning to venture from the sitting position! Soon we'll be losing our kids to the strangest places they find! awe, what a beautiful family there! love the thanksgiving family pic! always love your posts and reading up on you guys!! thanks for sharing! TEXAS SNOW down by the GULF!!!!!!! !